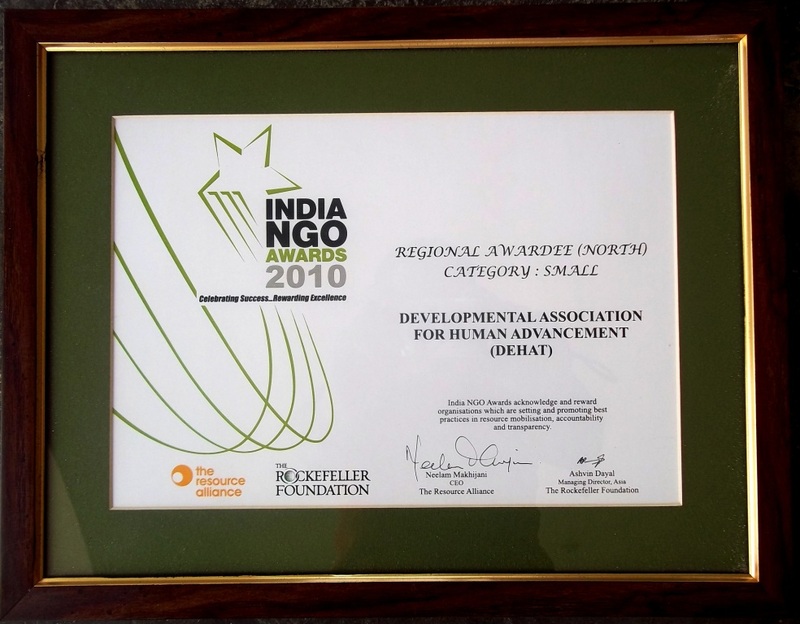 In 2010, DEHAT was one of four non-governmental organizations in the country to be recognized and honored with the India NGO Award (NGO of the year) at a function organized on the 5th of August, 2011 at the India Habitat Centre, New Delhi. Award Background: The Resource Alliance, in association with the Rockefeller Foundation, selects the winners of this prestigious award on the basis of their highest standards of resource mobilization, accountability, and transparency. India NGO Awards are the most coveted awards in the country to honor NGOs adopting good standards and practices during implementation of their programmes. On 18th February, 2016, DEHAT has been conferred with The ‘Certificate of Merit’ in the category of Social Cause and Empowerment at ‘India’s Most Ethical Companies Conference and Awards’. Award Background: The Award has been instituted by The World CSR Congress, and recognize impact on the way business is conducted in a socially responsible way by fostering a culture of ethics and culture. A total number of 123 countries from across the Globe has participated at the Congress.The award ceremony took place at The Taj Lands End- Mumbai at The 5th Edition of The World CSR Congress 2016 event. On 22nd January 2016, #100WomenAchievers Award has been awarded to Mrs. Bhanumati (Board Member of DEHAT) by Dr. Pranab Mukharjee- The Honorable President of India and Menka Gandhi- The Honorable Minister of Women & Child Development. She’s been awarded for her incredible leadership while DEHAT’s ‘Forest Right Movement’ (started in 2003) for 8 forest dwelling villages, which is now officially recognized as Revenue Villages and enjoying all The Government Schemes after 147 years of Neglect and Abuse. The best part of this award is that Mrs. Bhanmati is the only one, who is illiterate among other Women Achievers of the country but still leading 3000 women for their rights. Award Background: The Ministry of Women & Child Development in collaboration with Facebook had launched the ‘#100Women Initiative’ in July last year to recognize and acknowledge women who make a difference in their communities. The process involved a contest to select 100 women achievers through public nominations via social media. On 2nd December, 2015, Swayam Awards-2015 has been awarded to Rekha, Gulaicha who’re adolescents, students and a member of Women Rights Forum from our ‘Bravo Girls’ Initiative and Ms. Sunita Chakravarty who’s teacher and a member of Women Rights Forum from our ‘Swadhyaya’ Initiative by Mr. Akhilesh Yadav- The Honorable Chief Minister of Uttar Pradesh in the presence of Mahesh Bhatt (Director of Bollywood) & Anshu Gupta (Ramon Magsaysay Awardee) under the banner of India’s Leading Rural News Paper Gaon Connection. This honor has been given to them for their incredible & empowered contributions in their communities. Award Background: A total number of 12 women from all across the Uttar Pradesh has been selected by the Chief Minister of Uttar Pradesh and Gaon Connection to set an extraordinary and empowered example for the entire nation. 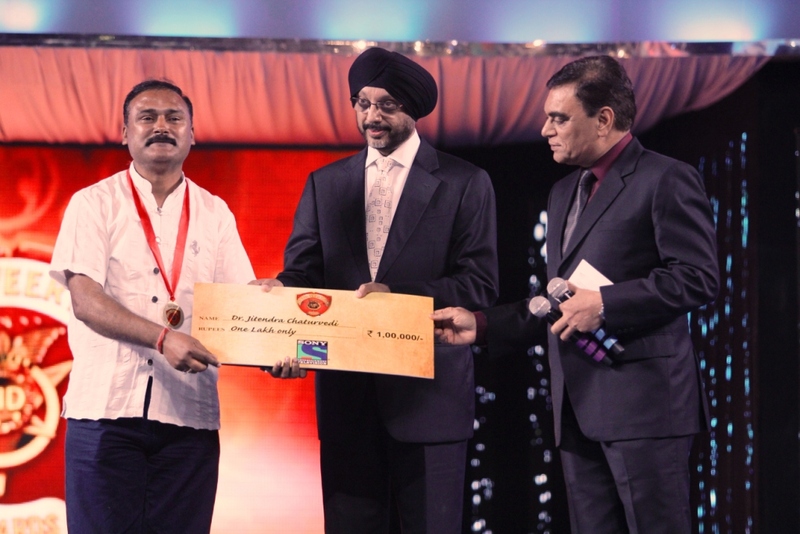 On 15th November, 2015, Dr. Jitendra Chaturvedi-Founder and Chief Executive has been awarded with The ‘Pride of the Nation Award-2015′ by Mr.Syed Sibtey Razi- The Former Governor of West Bengal , Jharkhand and Assam, for his endeavors towards missing, trafficked or vulnerable or underprivileged children among us. Award ceremony took place at Ravindralaya Auditorium, Lucknow, Uttar Pradesh. Award Background: This award has been instituted by the SEEMAPURI TIMES & TIME India News and recognize some of the extra ordinary social efforts of people from across the country. On 14th November 2015, DEHAT has been honored as ‘Social Enterprise of the Year’ in the category of Food Security & Livelihood at ‘Manch’ Summit 2015 by Mr. Akhilesh Yadav- The Honorable Chief Minister of Uttar Pradesh for its outstanding replicable model of Modern Farming Techniques among the farmers having less than average land holdings. Award Background: ‘Manch’ is a Social Entrepreneurship summit to identify impactful social enterprises from across the country. This annual event is organized by The FifthEstate with the support of the Government of UP and took place at Chief Minister’s Residence, Lucknow, Uttar Pradesh. Here’s how Government of Uttar Pradesh and FifthEstate has described DEHAT’s initiatives. DEHAT has been honored as first runner-up in the Education category of the Dasra Girls Power Awards for its outstanding efforts in educating and empowering the adolescent girls. Award Background: Dasra Girl Power Awards highlights the achievements in three areas of interventions: Health, Education, and Life Skills.17 organizations from the entire country are shortlisted as finalists for each category. Ms. Kavita Ramdas, the Asia Chief of the Ford Foundation, presented DEHAT with a distinction to honor our efforts in girl child education. On behalf of Bahraich Civil Society, Dr. Jitendra Chaturvedi, DEHAT’s Founder and Chief Executive has been awarded with The Bahraich Ratna Award for his endeavors towards benefitting disadvantaged children among us. 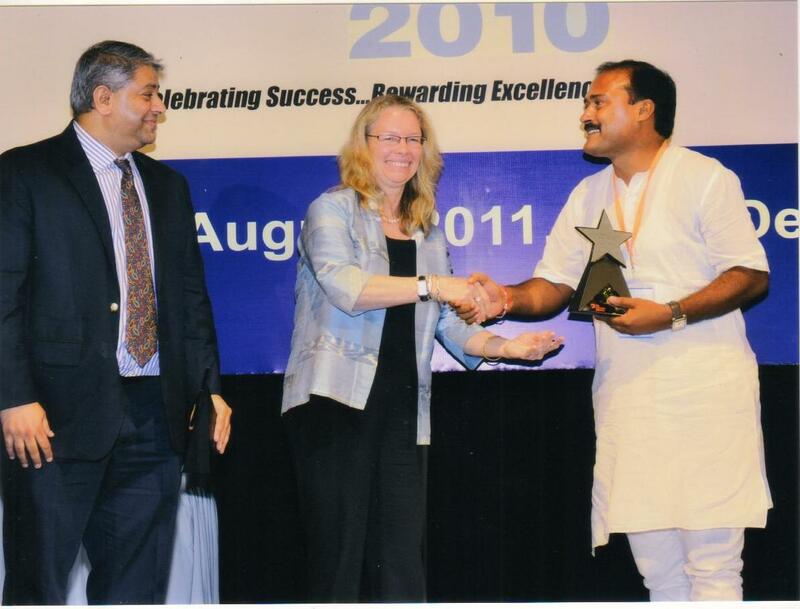 On the 11th of March, 2012, Dr. Jitendra Chaturvedi, DEHAT’s Founder and Chief Executive, has been awarded with the gold medal at ‘The Social Bravery Award 2012′ for his commendable work towards humanity. Award Background: This award has been presented by Bollywood under the banner of the SONY Entertainment Network in Mumbai. 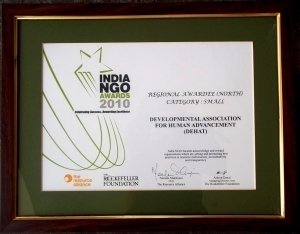 DEHAT – India is one of the five volunteer organizations (along with Water Aid-UK, Ashi Naga-Japan, Head Strong-Ireland, and Living Earth-Uganda) finalized at the international level for Global Awards, 2011. The Manjunath Shanmugam Integrity Award has been given to DEHAT for its integrity, commitment, and efforts against corruption for ensuring Constitutional Rights to Forest Dwelling Communities. 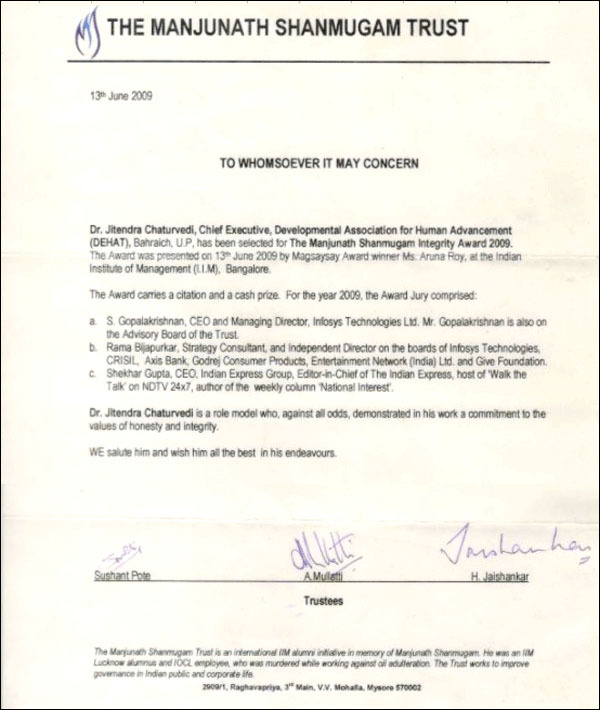 Award Background: On the 13th of June, 2009 at IIM-Bengaluru, Manjunath Shanmugam Trust (MST)presented this prestigious Award by Ms. Aruna Roy, the Ramon Magsaysay Award winner and a well-known social activist. The MST is an international IIM alumni’s initiative in memory of Shanmugam Manjunath, an alumnus of IIM Lucknow and an Indian Oil Corporation officer who was murdered while working against oil adulteration. The award has been presented by Dr. A.P.J Abdul Kalam, The Former President of India, to the Gram Panchayat ‘Shahpur Jot Yusuf’ of Chittaura Block of Bahraich District, adopted under Lokshakti program of DEHAT. The award was received by the Gram Sarpanch Shri Noor Alam on 23 March, 2006 in Vigyan Bhawan, New Delhi.